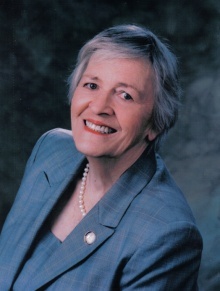 Nellie Dunaway Duke was appointed to Georgia Commission on Women by Lieutenant Governor Pierre Howard when the Commission was created in 1992, subsequently twice re-appointed by Lieutenant Governor Mark Taylor. After serving for two years, during which she chaired the Public Hearing Committee providing direction for the Commission on Women, in 1994 she was elected Chair, a position she still holds. A native of Rome, Georgia, Duke and her husband Henry have lived in Carrollton since 1964.They have five children, ten grandchildren and five great grandchildren. Nellie lettered in basketball and as a football cheerleader at Rome Girls High School where she graduated at age sixteen in 1947, continuing basketball with a semi-pro team until she married in 1949. She studied at Carroll Lynn School of Business and Chicago University. She involved herself in church, schools and community wherever the family lived, including Rome, Summerville and Carrollton. She volunteered with Girl Scouts, Boy Scouts and church youth groups. She coached girls basketball for the recreation department, was an advocate for schools, serving as PTA president at Summerville Elementary. Her work experience included sales, marketing and interior decorating at JC Penney and Sears in Rome. She was Methodist Youth Counselor at First Methodist Church in Summerville, and worked as Education and Youth Director at First Methodist in Carrollton, before assuming a similar position with the Carrollton Recreation Department where she directed teen activities. From 1970 until1982, she worked as field representative for American Cancer Society, honing her skills in education and political advocacy. In the 70's, she was area coordinator for ERA Georgia, continuing to lobby locally, statewide and nationally for health, education and women's rights during the 80's, up to 1992 when she became a charter member of the Commission on Women, where she continues to serve. Serving on the board of twelve organizations, she founded the West Georgia Women's Forum, Stopping Violence Where We Live, Carroll County Veterans Memorial Park and the Carroll Association for Prevention of Sexual Assault. She is on the Advisory Board of Possible Woman Foundation, Atlanta Women's Network and Women's Information Network. She served four years on the Community Advisory Board of Southwire Company. She was instrumental in founding the Georgia Osteoporosis Initiative, Georgia Woman of the Year Committee, Inc. and the Childhood Health & Over Weight Initiative. Her most recent achievement is as the Founding Chair of Georgia Women's Institute. She serves the Leadership Council of Stennis Center for Public Service, and the Southern Women in Public Service Leadership Conference. She served four years as Chair of the Equal Employment Opportunity Commission’s Stakeholder’s Task Force, where she gained invaluable training and expertise in employment issues for women. She was also a Charter Member of the Women’s Advisory Council for the Georgia Department of Corrections.